Hello! Thank you for coming to visit us here on the Visible Image blog today! Are you enjoying our NEW stamps previews? #7 will be along a little later. Tweedle Dum and Tweedle Dee have caught my eye at Visible Image this fortnight. The stamp set has one tweedle on it, but if you white out the pupils of the eyes and redraw them with black fine liner, then you have them both! 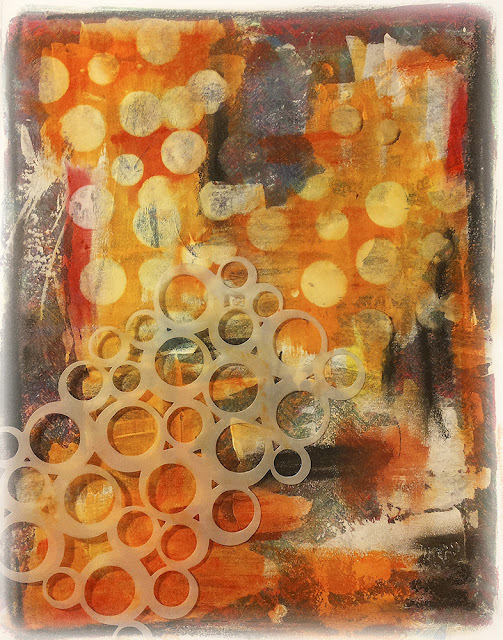 Finally I overcame my ‘fear’ of using the gelli plate and had heaps of fun creating some backgrounds. The background behind the background was an off-cut of one of these. I don’t know what I was so afraid of! The tweedles were easy to colour in and easy to cut out! Love that! I have been adding to my stock and now have quite a good range of Visible Image stamps for sale in Australia….so, exciting times ahead. Thanks Dot! What an awesome card! 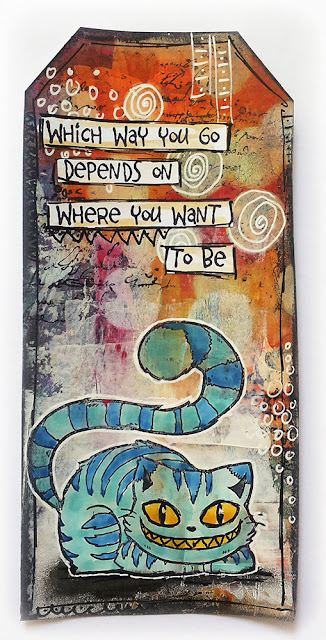 Love love loving that background ♡ Looking forward to seeing more of your gelli plate creations! You will find more of Dot’s gorgeous projects over on her blog, along with her contact details. All our current character stamps are sadly retiring, so if you want to get your hands on them you need to be quick! They have over 30% OFF right now! We hope you will pop back later to see preview #7. Thanks again for visiting today. Hello! Thank you so much for stopping by! Happy 2017!!! Did you miss me – I certainly missed you all, and am happy to back in my Thrilling Thursday slot for Visible Image stamps. This is the start of my third year with the team and I am certain that it will be as inspiring and full of originality as the previous two! My background was created with alcohol inks applied to Yupo ‘paper’. Yupo is a synthetic substrate made from polypropolene and has a plastic, shiny surface. It is ideal for alcohol inks and although quite expensive, definitely worth trying out if you like creating different effects. Tweedle is coloured with Promarkers and Brushmarkers, with some blingy flower gems added to his trousers! !I carefully cut him out, backed him onto black card and cut around, leaving a black border so that he stood out from the colourful background. I covered the background with yellow alcohol ink before dripping different colours on top to create spots of colour. 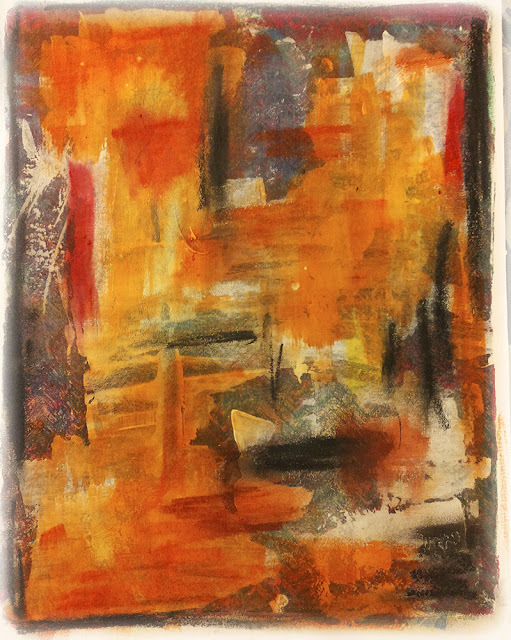 I then took a felt pad and added some drops of Blending Solution to it before randomly dabbing over the background to create the marbled finish. Thanks again for visiting! We’ll have more awesome inspiration for you later today, with Pauline’s first project of 2017. Hello there! Thanks so much for visiting us here on the Visible Image blog today! Today I have another fabulous project using Visible Image Stamps. Dawn and Brian are the hippest zombies on the block and here you can see them letting it all hang out (quite literally!) at the disco! 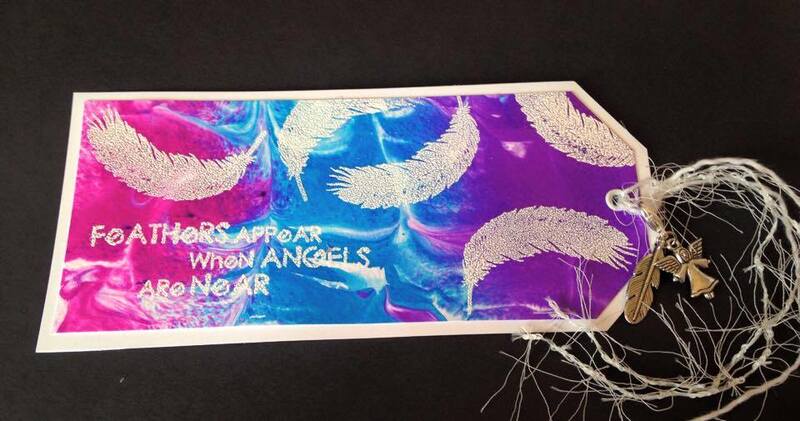 My background was created with Dylusions Ink Sprays and a sprinkling of rock salt before stamping with the star bursts from the Sparkle At Christmas set. I used WOW fluorescent orange and green embossing powders, and added adhesive gems to the centres. Dawn and Brian were stamped onto some card with a blended Distress Ink background before cutting out and layering onto my background. The sentiment is embossed with my WOW powders to match, with a couple of gems for extra bling! LOVE this! Thank you Teresa 🙂 Zombies love DISCO too!!! Fabulous card! You can find more of Teresa’s Halloween projects over on her blog. We will be back a little later with an awesome mixed media project from Pauline, so make sure you pop back later for that. Have a great Friday! And don’t forget to visit our Facebook PAGE to see which stamps are on offer for our Freebie Friday giveaway this week!!! On to today’s inspiration and Teresa Morgan has been getting into the Halloween spirit this week.. well it is October! 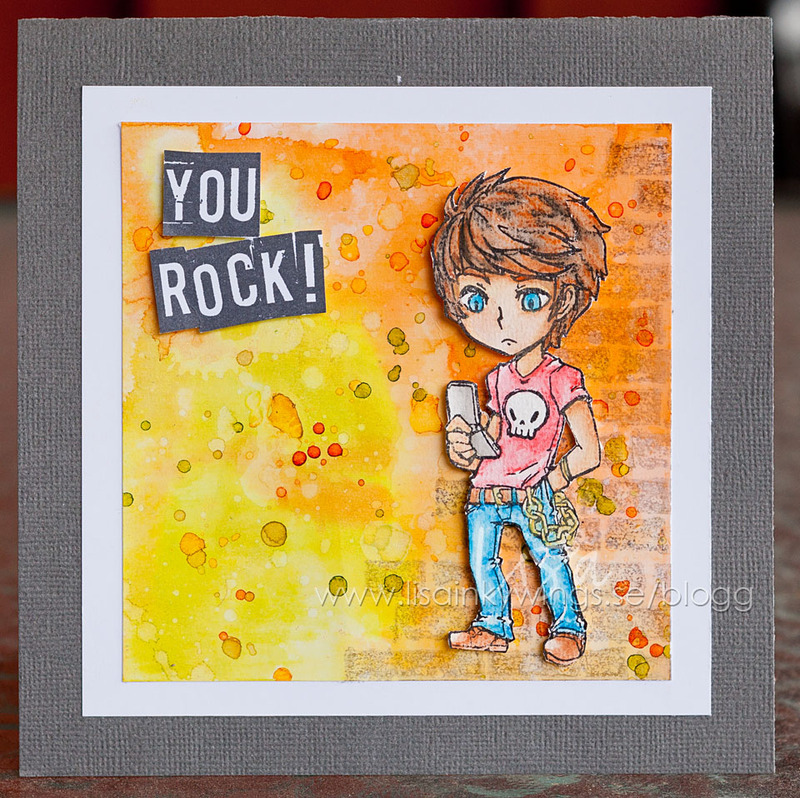 Today is my turn to share some Visible Image stamps inspiration with you all….. 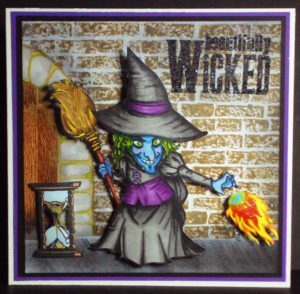 I have used the beautiful Wicked Witch set from Visible Image, coloured with Promarkers. The edge of the card is framed with the Large Winter Tree stamp, and I added Stickles to the branches and fireball. October is Breast Cancer awareness month, and the Visible Image team have a massive fundraising event for this worthy charity. Our Show and Tell challenge has a PINK theme, there’s a BIG PINK BLOG HOP from the DT on October 16th, and there is Limited Edition pink packaging on the ‘Stay Strong’ stamp. Visible Image Facebook Group – Daily DT inspiration, Monthly Show and Tell Challenge, hang out with other Visible Image fans, and share your work! WOW! Loving this card Teresa… awesome work thank you! We hope you will join our event and help us to raise lots of money for our chosen charity, which is one very close to our hearts. Also hope to see some of you at Port Sunlight… we will share some photos of the show and Pauline’s demos next week 🙂 We will be back on Monday with all the latest Design Team projects too… but if you want to see them sooner, come and join our Facebook group! Today it’s my day for Visible Image Stamps. As an exception I created a monochrome card this week. My main image is the lovely white rabbit from Alice in Wonderland. I love this image and the sentiment is so true! I used the Retro Dots for my background and the ornaments from the Revolution Set to embellish the card. The doily is a Cottage Cutz die. 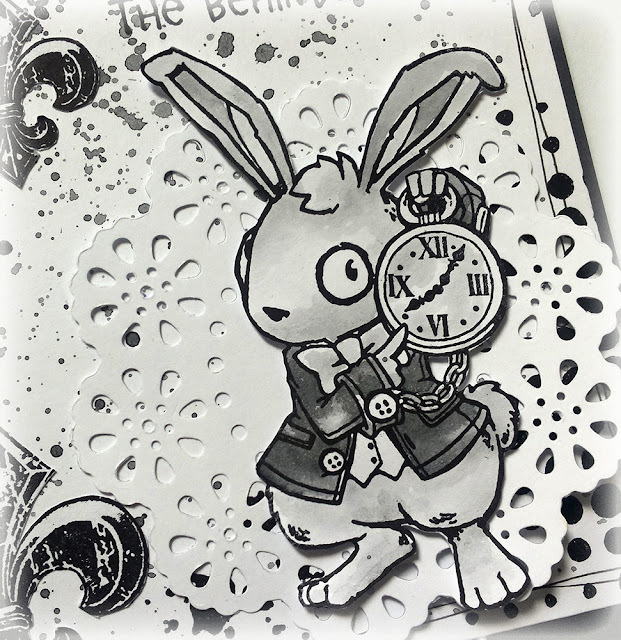 Isn’t this awesome… our White Rabbit looks great in monochrome! You will find more of Susanne’s amazing work over on her blog. We will be back later with the very first cards created with some our NEW Christmas stamps. Good Evening 🙂 How’s your week going? Can’t believe it’s almost the weekend again already! We are back with more inspiration… especially for those of you who have bought our Zombie stamps! We can’t wait for the spin off of ‘The Walking Dead’ to be released later in August… really missing the show, as we are sure all the other fans are! Welcome back for another dose of Visible Image inspiration. 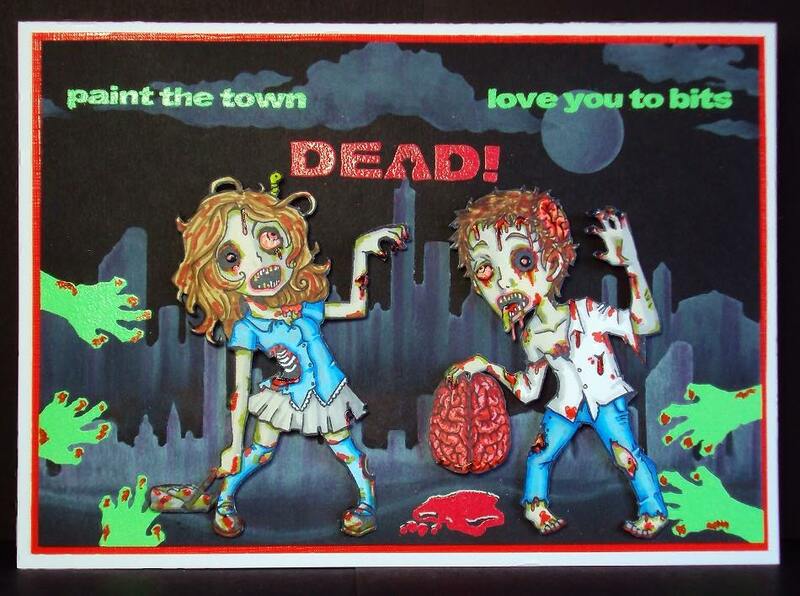 Today I have created a dimensional card featuring our gorgeous zombies: Dawn and Brian. 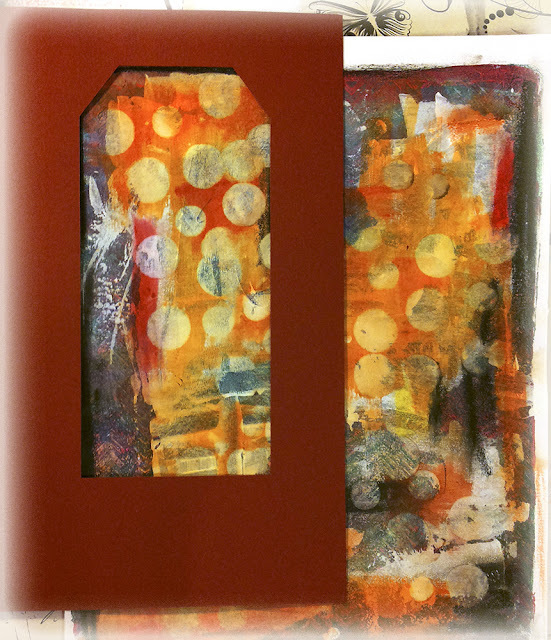 The background was created with Spiced Marmalade, Festive Berries and Black Soot Distress Inks. I then stamped the Winter Tree around the edges with black ink, and again with Versamark and Ranger Sticky Embossing powder to add some red foiling. I die cut some ‘tombstones’ from white card, added some Distress Inks and drew some details on freehand. Dawn and Brian were stamped with Memento ink and coloured with Promarkers. I cut some ‘grass’ from black card to add in front of the characters and tombstones. Finally I stamped the sentiment and hands onto red pearl card, matting onto black and red before assembling everything together. Awesome 3D project… Love that red sky! You’ll find more of Teresa’s fantastic work over on her blog. What have you been creating with our stamps? Show us over in our Facebook Group for your chance to WIN a £25 voucher! Thanks for visiting our blog today, we will be back shortly with a fabulous new card from Elena. Hello 🙂 Thank you for visiting our blog today. After cutting it out I stamped some interest with the script stamp from the Visible Image Revolution Set using Archival Jet Black Ink. 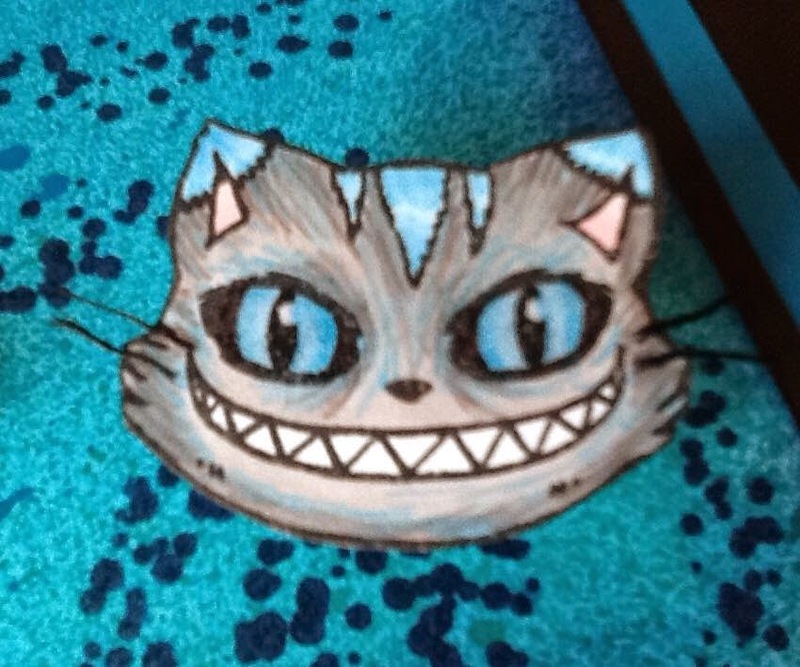 The Cheshire Cat is colored with Neocolor II. I added some interest with a white and black UNIPosca Marker. You’ll find more of Susanne’s fantastic work over on her blog. We will be back tomorrow for another week packed full of Visible Image stamps inspiration from our amazing team! If you missed any of our previous posts, you will find them HERE! Enjoy the rest of your weekend.. Welcome back to another Thrilling Thursday blog post from me for Visible Image stamps. This week I have used elements from all the new Space sets (as well as a couple of other stamps) to create a set of nine ATCs. 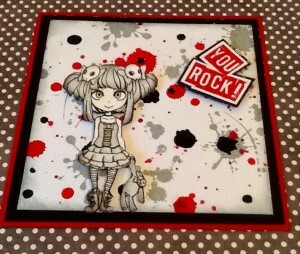 This was a great way to show off all the stamps and use some of the funky inky backgrounds that I have in my stash!! The backgrounds are a mix of shaving foam technique, Dylusions ink sprays and Brushos – all different but all bright and colourful!! The characters are coloured with Promarkers and Copics, and I have used black, white and fluorescent green embossing powders. See you here next Thursday! Aren’t they awesome! Love the backgrounds and those fantastic colours. Such a super cool project 🙂 You will find more of Teresa’s inspiring work over on her blog… there’s nothing this lady can’t do! Goodnight.. or Nos Da as we say in Wales. Good Afternoon! Thank you for coming to visit us today. It’s Soozie Tooseday and today for my DT day for the fab Visible Image. I’ve used the creepy but awesome Zombie Dawn Set, Forest Background, and the fab ‘Grungy Edge’ from the Edgy set. Using my favourite colour combination of red and black on white card. Dawn was coloured in using promarkers, the skull is from the Max Rocks stamp set. Lastly I added lots of bling for that extra twist! I hope you’ll enter our July Show and Tell challenge… You can win stamps galore! For all the latest news, join our Facebook Group, or take a regular gander at our Blog homepage. Thank you for perusing my post, and see you again soon I hope! Fantastic card, perfect setting for Zombie Dawn, and loving those blingtastic creepy hands!You’ll find more of Sue’s awesome work over on her blog. Hope to see you back here tomorrow for more fabulous Visible Image stamps inspiration. We are back with more inspiration for our NEW Alien Invader Set this evening, and just wait until you see what Lisa has created with it! Lost in space! Oh, I hope not, but you never know with these green men around. This is the brand new Alien Invader Set from Visible Image I’ve used today. I think he is a bit cute, so I added some pink to my card and it took most of the drama away… lol. I’ve added a bit of glitter to the rays, but I don’t think it shows up on the picture. Wow what an awesome card! Love those 3D rays! Amazing colouring and love the touch of pink! You’ll find more of Lisa’s fantastic work over on her blog. Enjoy your evening! We’ll be stamp cutting and packaging until the early hours 😉 Good job we love what we do and you can’t sleep in this heat anyway!!! Good Evening 🙂 Thanks for coming to visit us today. Right on to today’s inspiration… Here’s Suze! I’m here to share some more awesome Visible Image stamps with you. Alien Invader Set and what an amazing set it is! Two awesome cards from Suze! They’re Alientastic!!!! 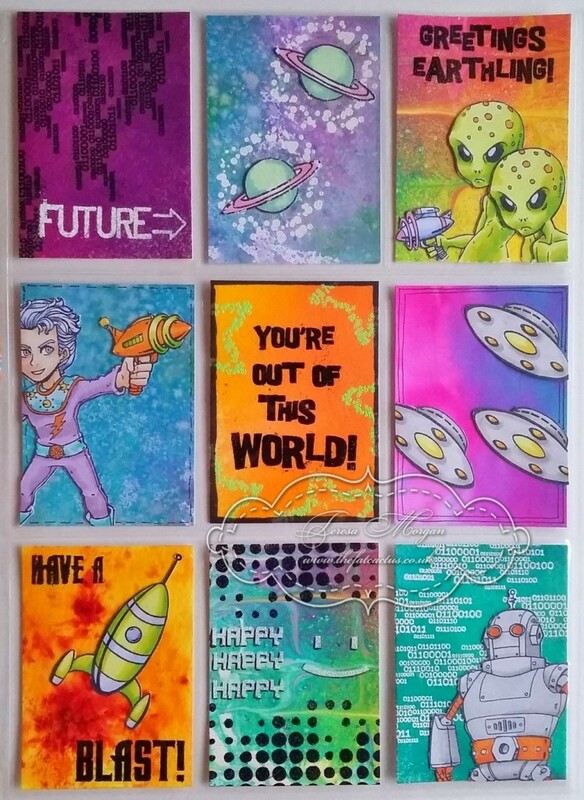 You could also say they are ‘out of this world’ 😉 You’ll find more of Sue’s unique cards over on her blog. We’ll be back tomorrow with more Design Team inspiration for you. Back today with more fun Visible Image stamp play! 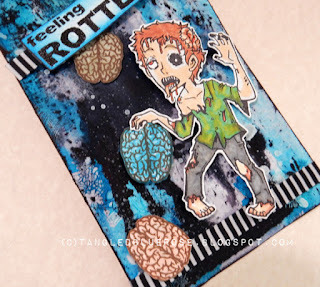 I have a small art tag I made using the Visible Image new release Zombie Brian! “Feeling Rotten?” Never fear Zombie Brian has fresh brains to share! I love making tags, they are small and fun to try out new things without much worry. The background I started by cutting a tag from a manilla folder. 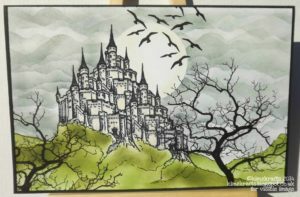 I dropped some Jet Black Archival Re-inker on my craft mat along with rubbing alcohol and white acrylic paint. 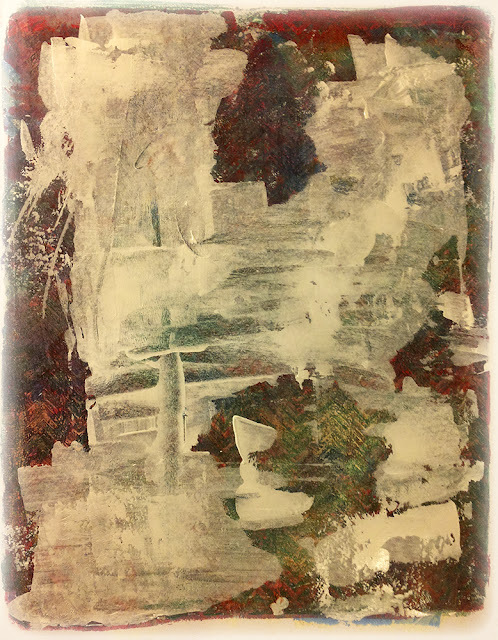 I misted the tag with rubbing alcohol then swished it into the ink and paint on my mat. I sprayed a some more rubbing alcohol to make things run. Now more fun. I painted some matte medium over the whole tag. Once that layer was dry I covered the whole thing with clear crackle. Once dry and cracked I dabbed some alcohol ink, blue, onto the cracks. I sprayed it with more rubbing alcohol to get to to run and dabbed off some for variety. I so looooovvve the cracks and darkness. I think it made a fun “Midnight” tag for dear Brian! When you have time, please so check out all the fantastic stamps at Visible Image, they are magnificent! Awesome tag from Kim! And you’ll find more of Kim J’s work over on her blog. Good Evening 🙂 A very late post from us today… it’s been a long old day! Welcome back for another day of Visible Image inspiration. This week I would love you to meet Dawn and Brian….they have been DYING to meet you!! The background was created with Dylusions Ink sprays. I stamped the zombie hand with black Versafine ink to create a border at the top and bottom. 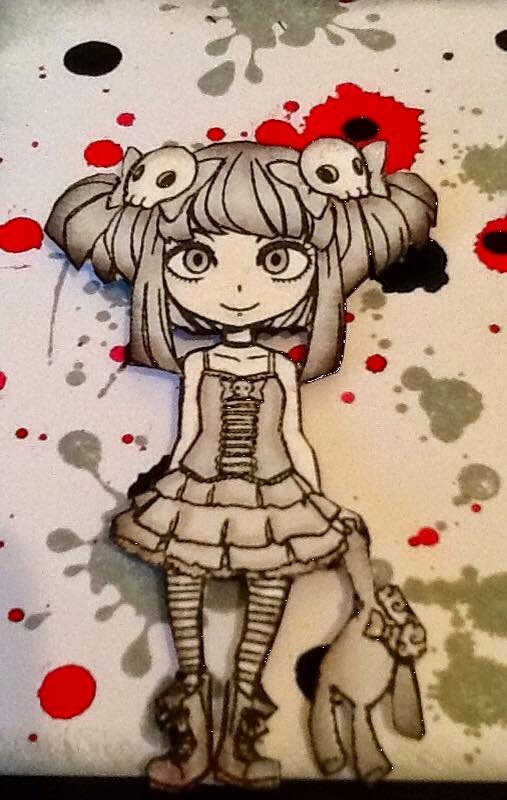 Dawn was coloured with Promarkers then cut out before being glued in place. I finished with one of the two sentiments that comes with the set. I used Distress Ink to stamp my background of brains and words. Like Dawn, Brian has two sentiments in the set with him. 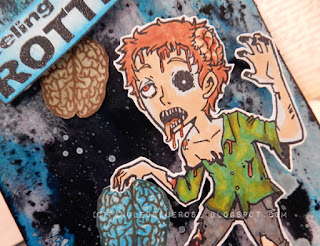 I then took a tag coloured with Dylusions inks and randomly stamped more brains with Distress Ink. I then coloured Brian with Promarkers and cut him out to fit on the tag. A few fibres and the Feeling Rotten? sentiment finished this card. I hope you love these two new characters as much as I do – they were such fun to use! Perfect for fans of The Walking Dead aren’t they! We will be back shortly with Elena’s very first Visible Image Design Team projects. Good Evening! 🙂 Hope you are having a great Saturday! It’s Saturday again and I’d like to show you my newest card with Visible Image Stamps. I used the lovely “White Rabbit“ Stamps set. It is so fun! The little sweety is colored with watercolor pencils. I used papers from My Minds Eye for my background layers. The gear wheel is a die from Noor! Design. After cutting I covered it with Versamark ink and added some gold PanPastels. To give my card a more distressed look I added some gesso to the patterned papers and painted the card base with wax crayons. I hope you like my card, thanks for stopping by, see you next time, Susanne. Isn’t this awesome! Loving the circle of cogs and Mr Rabbit looks amazing 🙂 Thanks Susanne! We’ll be back soon with Doreen’s gorgeous projects! Good Evening! Another very busy day so another late post today! We are catching up with orders after our ‘cheeky’ little week away 😉 And preparing for this weekend’s Stamp Magic show in Doncaster too! Hope to see some of you there. How cute is she? There are 6 characters available HERE from Alice in Wonderland. Todays creation is created in sepia tones, coloured with promarkers and inked in vintage photo distress ink, Alice and the slices of cake are stamped with espresso memento ink. and the fab ‘Trust your instincts’ sentiment from the No regrets set. The finishing touches were a silver mushroom charm and a glass ‘drink me’ bottle! I do hope you like my make, I love doing sepia toned creations. If you love making creations with our stamps then why not enter our Show & tell challenge which you can do through our facebook group. Hello There 🙂 Thanks so much for coming to see us here on the Visible Image blog today! As always on Wednesdays we have two inspirational projects for you. I did it AGAIN! 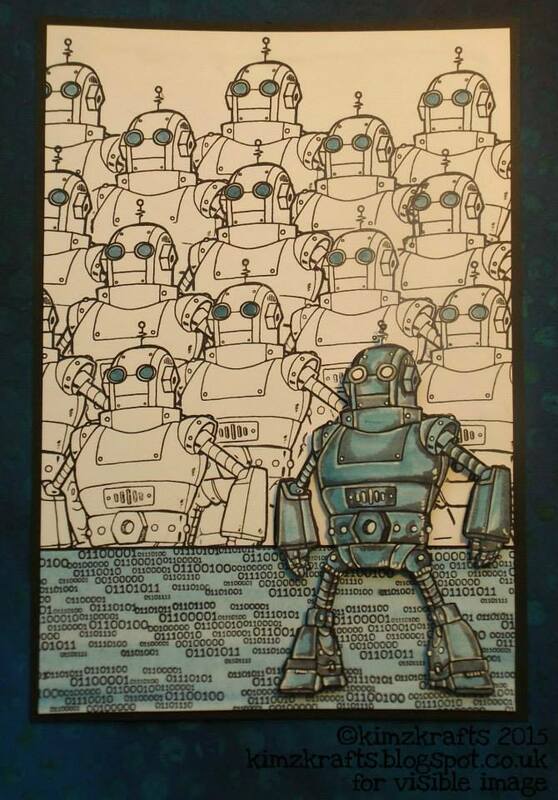 *sigh* Uses some lovely blue colors, and then I can’t find one little piece of paper in matching color. GAH! So typical me. Had to go with some yellow instead, and strange anough I liked it. The cool stamp is Alice in Wonderland and you’ll find her in the Visible Image shop. And if you see my misstake, just ssshhhhh (don’t tell). Embellishments: Flowers, Cheese Cloth, Doilies, Bling (Nellie Snellen), Enamel Dots (MME), Leaf Pin, Skeletton leaf, Net ribbon. You will find all the amazing Visible Image Design Team inspiration over on the BLOG. Come and JOIN the Facebook Group where you can enter our NEW ‘Show & Tell Challenge‘ for your chance to WIN some awesome Visible Image stamps! 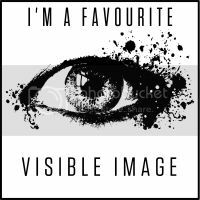 And don’t forget to LIKE the Visible Image FACEBOOK PAGE too. Pop back this evening for some awesome inspiration from Kim Robertson. Sadly Sue Joseph is suffering with awful flu still, so today Pauline Butcher is here to make Tuesday Terrific! 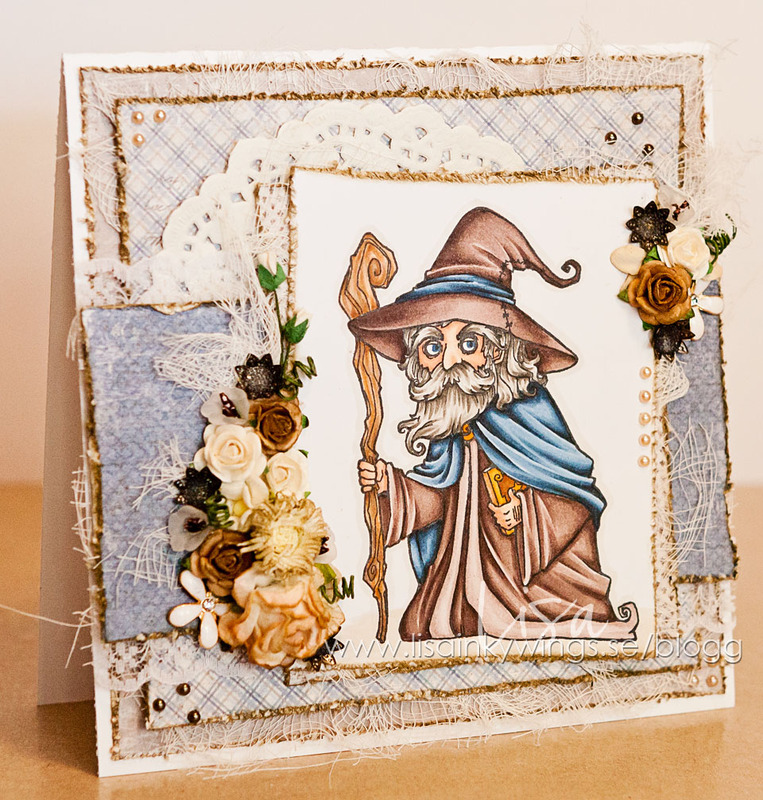 I’m sharing a card I made using a fabulous set from Visible Image, he is a cheeky little chappie, and I just love him. The stamp set I used is….. 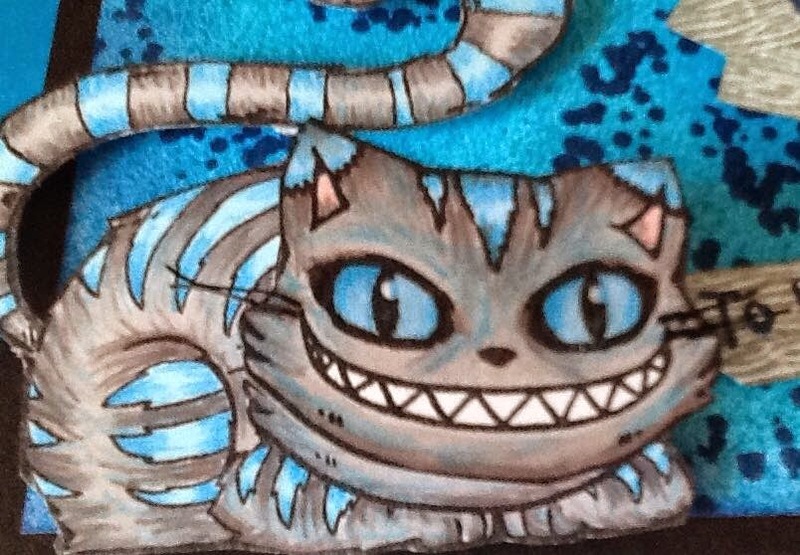 This is a 6″ x 6″ card, I took my topper and stamped the Cat in the middle, and coloured him using my Promarkers. Using a fine pointed paintbrush I painted over him with masking fluid, being careful not to go over the edges of his out lines. I placed the topper onto my glass mat, and with masking tape, masked off 1/4″ around all the edges. 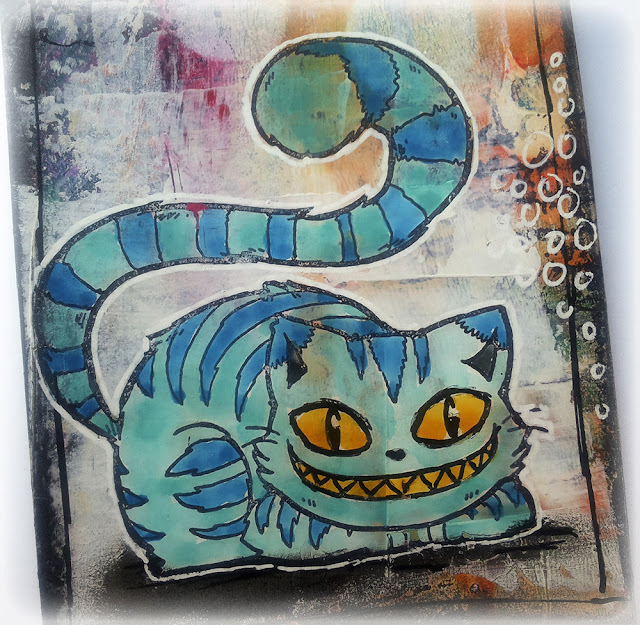 Using yellow acrylic paint and a wide brush I roughly painted the background, as the cat is covered with masking fluid, you don’t have to be too careful, when it was dry, I used Blue Acrylic paint with the wide brush with very little paint, and made criss cross patterns. When it was dry I randomly stamped the grinning face using Black Versafine ink. Again I left this to dry before I removed the masking tape, and with my finger gently rubbed off the masking fluid ( I love doing this, lol !!!) 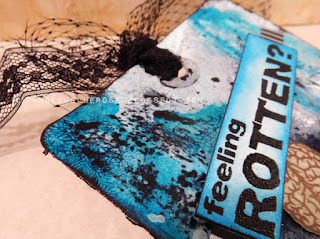 Using Black Versaine ink, I stamped the sentiment around the edges, then added Stickles and Glossy Accents to finish. Don’t forget to check out the ‘Show and Tell’ challenge for your Visible Image makes, only a few days to go for this month, get your entries in. There’s lots going on in the Visible Image Facebook Group too, check that out HERE. What a fantastic card! 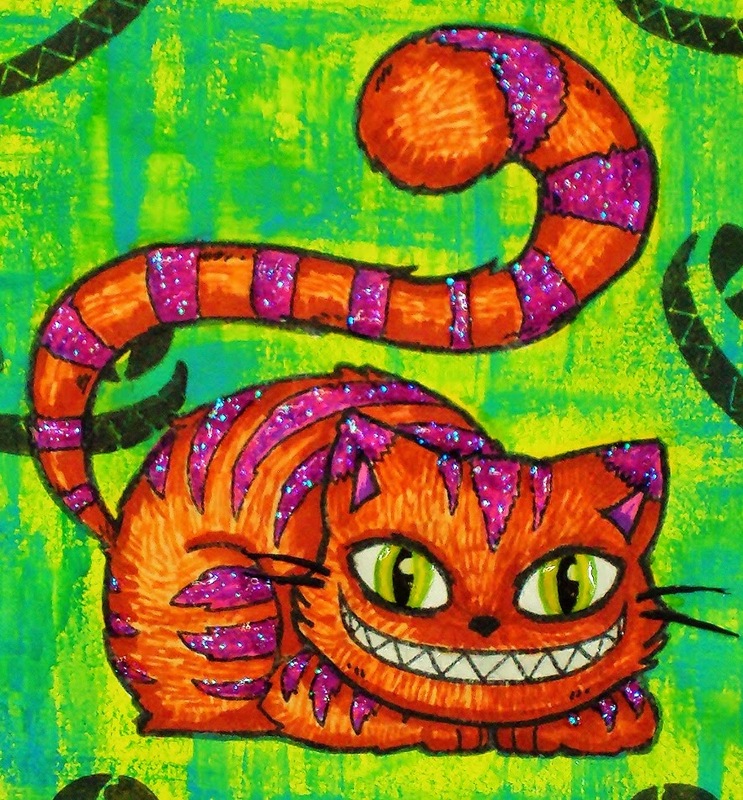 Love the background, it’s purrrfect for this magical Cheshire Cat! You can get your hands on him right HERE! Another week has passed in a blurrrr, not enough hours in the days to do all the crafting I’d like to, hehehehe !!! 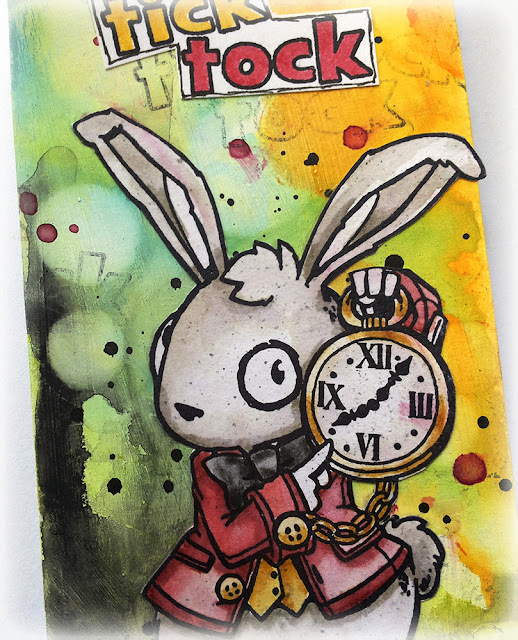 Today’s share from Visible Image Stamps, is a card made with the fabulous White Rabbit from the Wonderland collection. A slightly different take for me, I wanted it to look fresh and Spring like, and could be given as an Easter Card, so I kept the inking to a bare minimum. 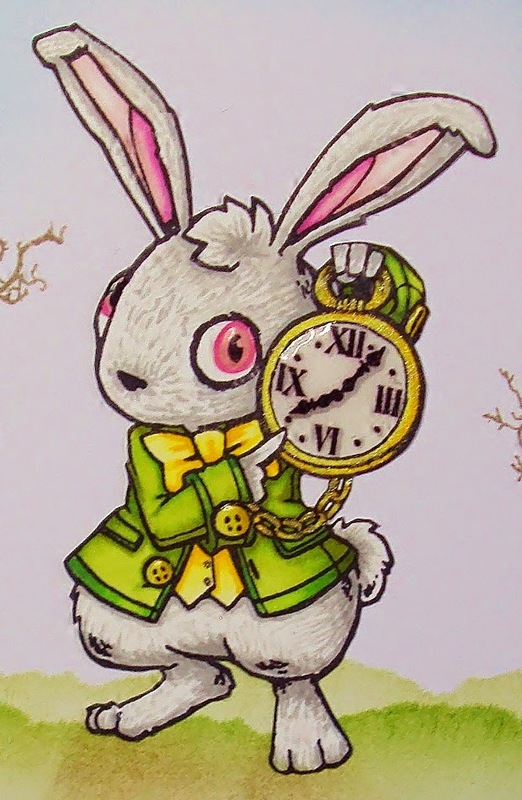 I stamped the Wabbit, he is sooooo cute, with Memento, and coloured him with Promarkers, adding some glossy accents to his eyes and watch, and a glitter pen to make some faux metal buttons and around the watch. I used very little Distress ink, just around the edges and to ground him, then stamped the Winter Tree to either side, and the sentiments that come with Wabbit. I hope you’ve added some Visible Image creations to the ‘Show & Tell’, there’s a chance of you winning some stamps, if yours is chosen at the end of the month. The Visible Image Facebook Group is buzzing at the moment, come and join in, loads of inspiration, and another place to share your Visible Image creations. 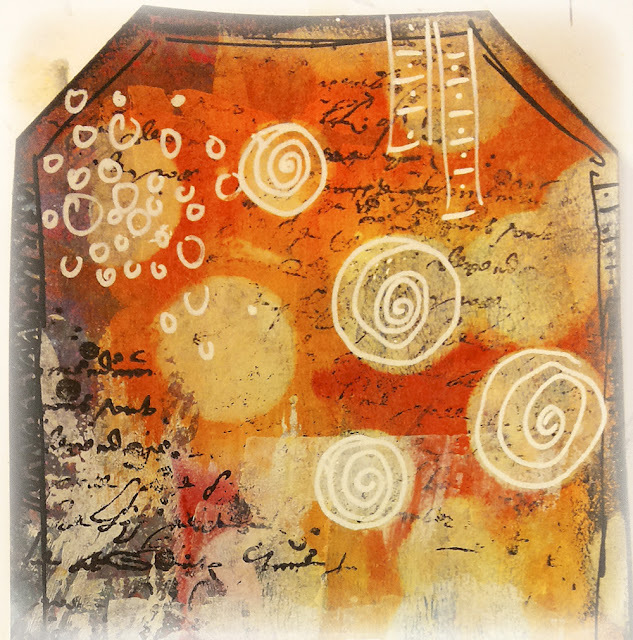 I have ‘Pauline’s Inky Workshop 3’ on Sunday, we will be playing with coasters, I shall photo’s and results on my blog in the week. For this card I used the Queen of Hearts, I think she is ACE! For the background I used the swirl from the Galaxy set. For the Queen I used my promarkers, for her hair, eyes, lips and jars I used clear embossing powder, on her dress and crown I used fairy dust to give some twinkle and added jewels to her crown. Finishing off with flat backed hearts 🙂 Mounting onto black and red card. I hope you like her, and here’s the link to all the NEW RELEASES, there’s some beauties! 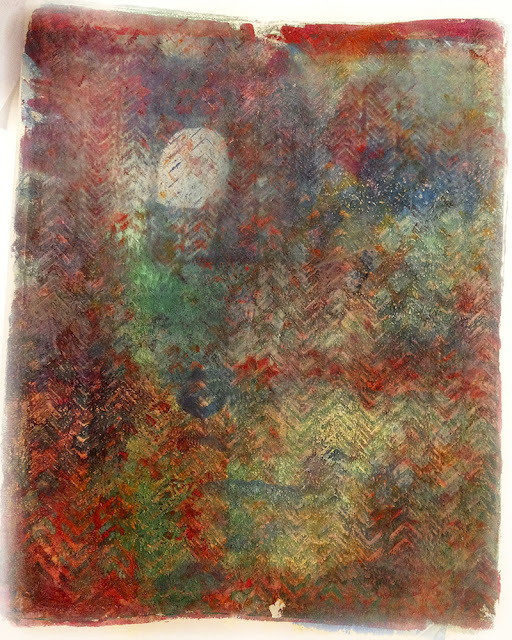 Hope you’ll come back and see us tomorrow for fabulous Friday with Pauline Butcher… it’s bound to be colourful! 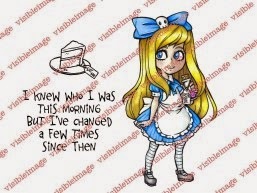 Today is all about our fabulous Alice in Wonderland stamps. If you missed this morning’s post you will find it HERE. 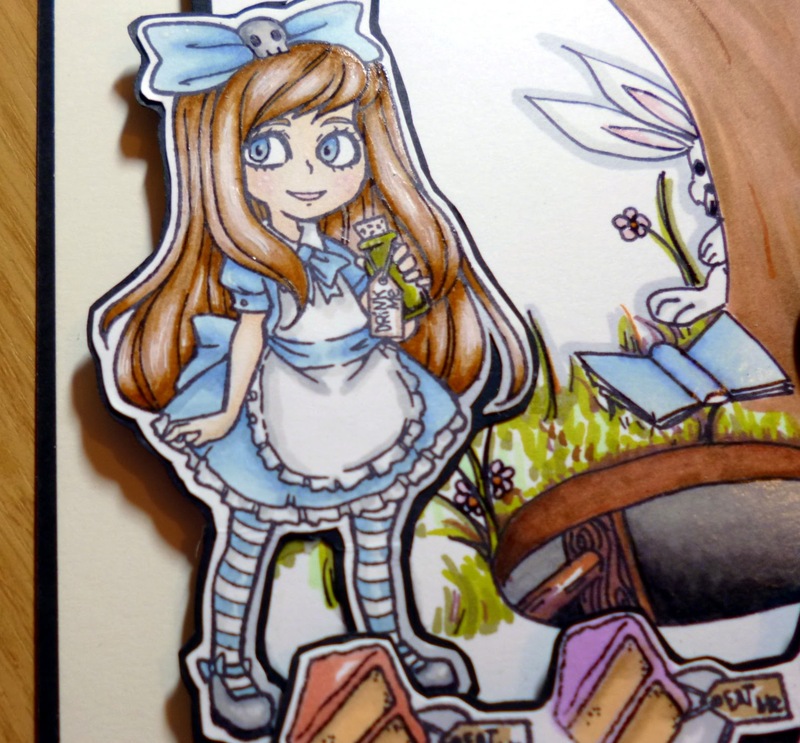 Today’s card is something totally different and I hope you like it as it is using of course the fabulous Visible Image and their new little character of course Alice… in wonderland and wow isn’t she a beauty. I just loved her the minute I saw her and wanted to do a backing befitting her so I started by drawing the hole and get some dept to it with several shades of Grey promarkers , I drew the whimsical tree to create the backing with a little bunny poking his head from around the tree. Alice had to have a book of course and the tree had to have a little door and a few other little extras. 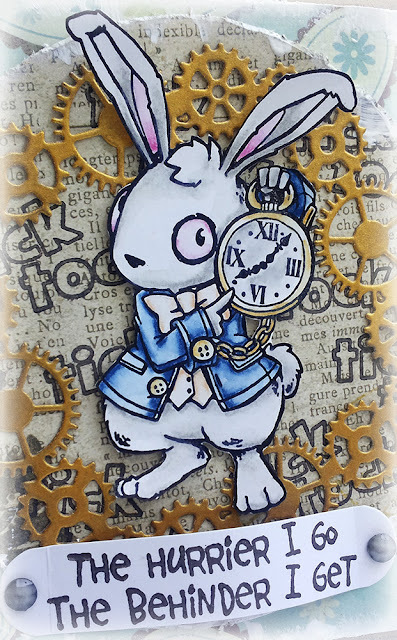 I stamped out Alice and coloured her and cut her out with fussy cutting, I then added her to black card and cut her out again, I used foam to raise her from the back ground too and added a huge pocket watch and some tiny keys here and there. I stamped and cut out the sentiment from the set and added a black backing too and added it ti the top right of the card. Here is the main image I very much was going for the whole story book image theme and I loved how this turned out looking so three -D like a story book page. 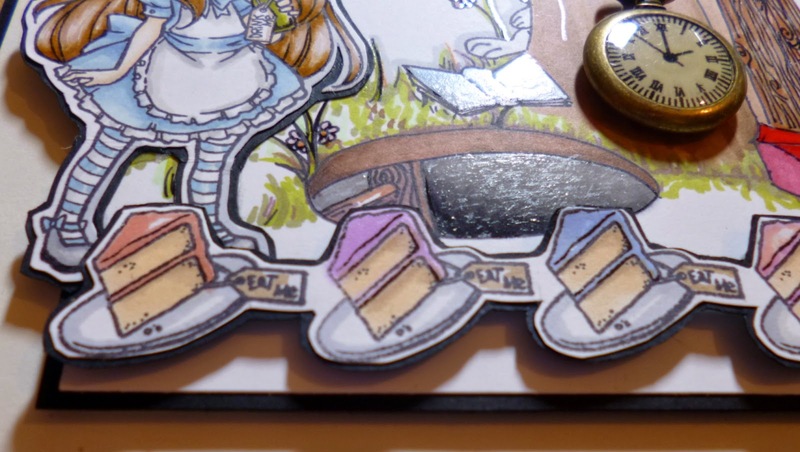 I also stamped the little cake out from the set and stamped several in a row and coloured them all with pastel colours and added them to black card and foam to add as a border for the bottom. 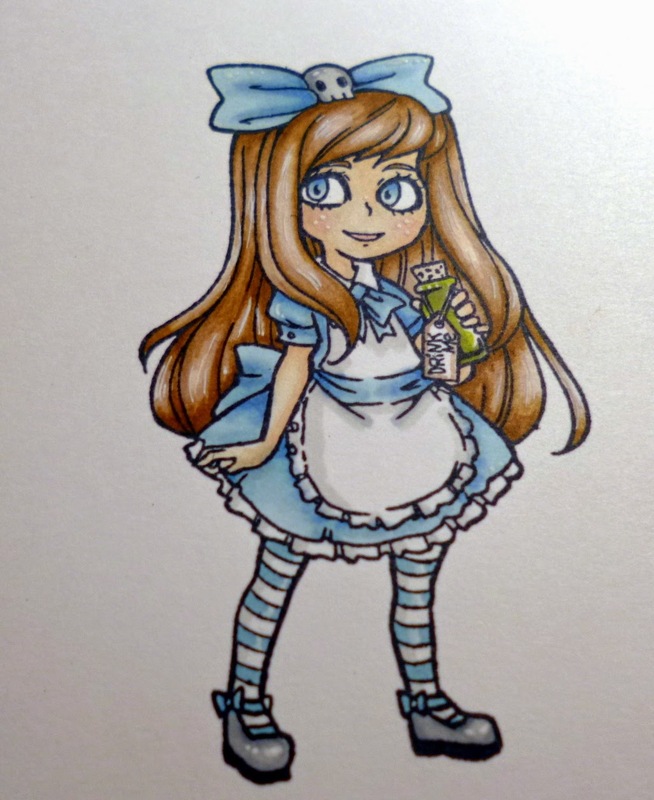 Here is a close up after I coloured Alice with Promarkers so you can see how gorgeous she looked. I went for a different hair colour to the traditional as I liked it with the blue dress. And once I had her positioned on my background I just love how her hair turned out and the handrawn hole with the ladder turned out really well and gave a lot of dimension to the hole piece. I love this sentiment too it made me smile from the first read. This launch really just screamed inspiration from the moment I saw all the gorgeousness and it is really just the beginning for this fabulous company and great friends. Here is a close up on the little story book scene and you can see the background also has its own mat and layers to keep it looking neat and smart and very clean but definitely not simple. I chose a completely black and white card scheme and a hand drawn by me back ground to compliment Helen and Marks gorgeous Alice in Wonderland set I hope I did them justice and they love it as much as I do. So again here is the main Image for you to see all together. Everyone on the team really has done some amazing work with all the stamp launches for the Stitches trade show up at the NEC last week, and lots of the work is being showcased each day here on the blog. So for today lots and lots of love to all and I hope you are having some milder weather where you are and spring is in the air. We are sure you have been inspired today to get your hands on these timeless Alice in Wonderland character stamps! Thanks again for visiting us today, enjoy the rest of your day. It’s wonderful Wednesday… wonderful because we have double Design Team inspiration for you today and the theme of the day is Wonderland! Today I’ve played with a character that I think many of us recognise.. Alice in Wonderland. Oh, at least everyone except me then… lol. I can’t remember I read much of that book as a child so maybe I need to update myself with the story a bit. Anyhow, you’ll find Alice and a some of her friends at Visible Image. Since I don’t know much about the story, I thought violet was a perfect color for the girl today. Embellishments: Flowers (WOC), Metall charms, Lace, Cheese Cloth. Other: Wink of Stellas on flowers. 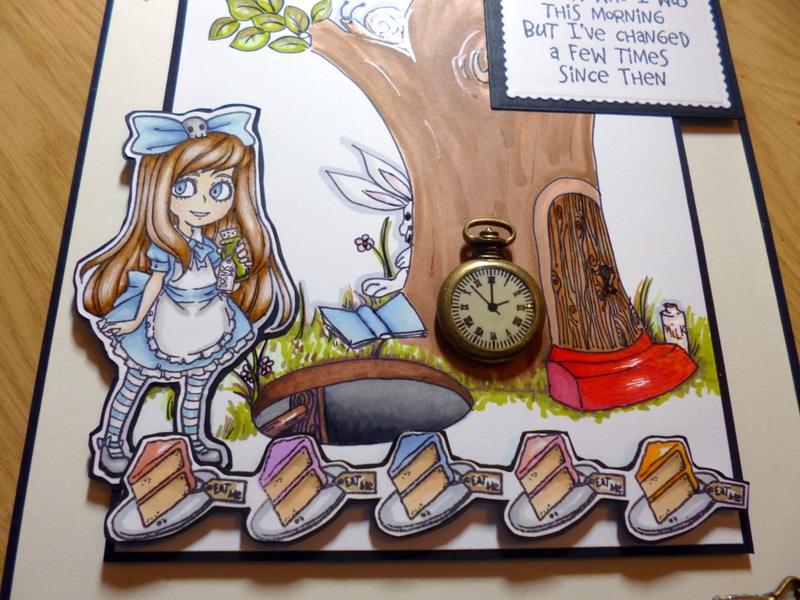 Pop back later to see what Kim Robertson has created with Alice! 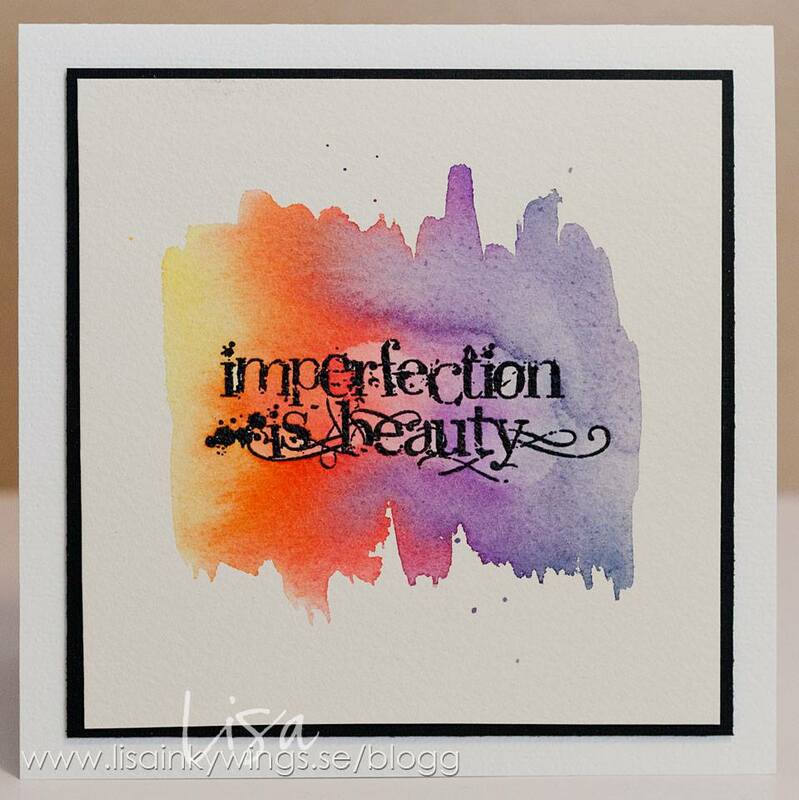 It’s Thursday again, and that means it’s my turn to share some more projects with the fabulous new stamp sets from Visible Image. Today I have two cards and a canvas that I made with the beautiful Queen of Hearts… It’s a long post – so sit yourself down and enjoy!! 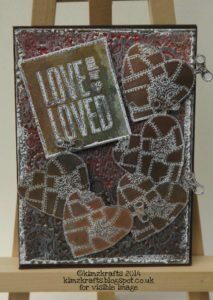 I used a spotty mask and Distress Inks (Festive Berries and Fired Brick)to create the background of this card. 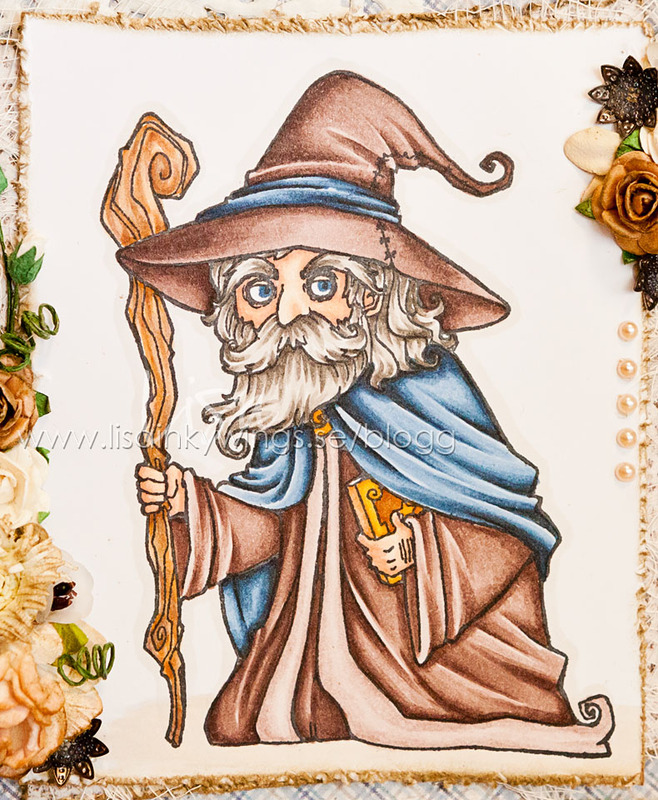 The image is coloured with Promarkers and Copics and mounted with 3d foam. I stamped the words onto the banners and added some Tea Dye Distress Ink before attaching with 3d foam. My second card is a Valentine’s card…. The Queen and heart jars are coloured with Promarkers and attached with 3d foam. For my final project I took a 7×5 canvas board and covered with black gesso. I used some white gesso through a diamond mask. Once this was dry I spritzed some gold mica spray over the canvas. I decoupaged the stamped roses, shaping the petals to create a 3d effect then added some red embossing powder on the bottom edges. I glued them in place and stamped some of the Drag and Drip stamps underneath and added more red embossing powder. I made the playing cards with stamps from the Harley Jester set and added Pumice Stone Distress Ink around the edges. These were attached with Pinflair glue gel to create dimension. The queen was coloured with Copics and Promarkers and attached with 3d foam. Come back tomorrow for fabulous Friday with Pauline Butcher. Another crazy day here so very late sharing today’s post! BUT… it was worth waiting for!!! Hi guys 🙂 ‘Soozie Tooseday’ again, it comes around soooo fast! Hope we are all well. For all the latest blogs and Inspiration they can be found the blog homepage HERE! Come and have a nose around our Projects Gallery, there are some amazing creations that will float everyone’s boat I’m sure! You can subscribe to our monthly Newsletter HERE! 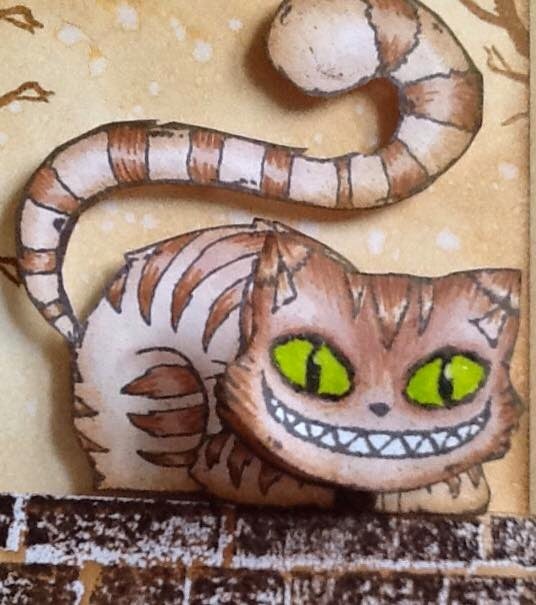 Amazing projects with our fabulous Cheshire Cat! Love them! You should see the blue one especially in real life… if you come to see us at the shows you can see it up close. Awesome work by Suze! We are busy busy making lots and lots of stamps and preparing for the CHSI trade show at the NEC this weekend! Very excited to be exhibiting there for the 2nd year running. If you are coming you will find us on stand BS29 in the Bright Sparks pavilion. We will be back tomorrow with double inspiration from Kim R and Lisa as it is Wonderful Wednesday! Firstly it’s over to Teresa for some ‘Bonkers’ inspiration with one of our NEW stamp sets!!! 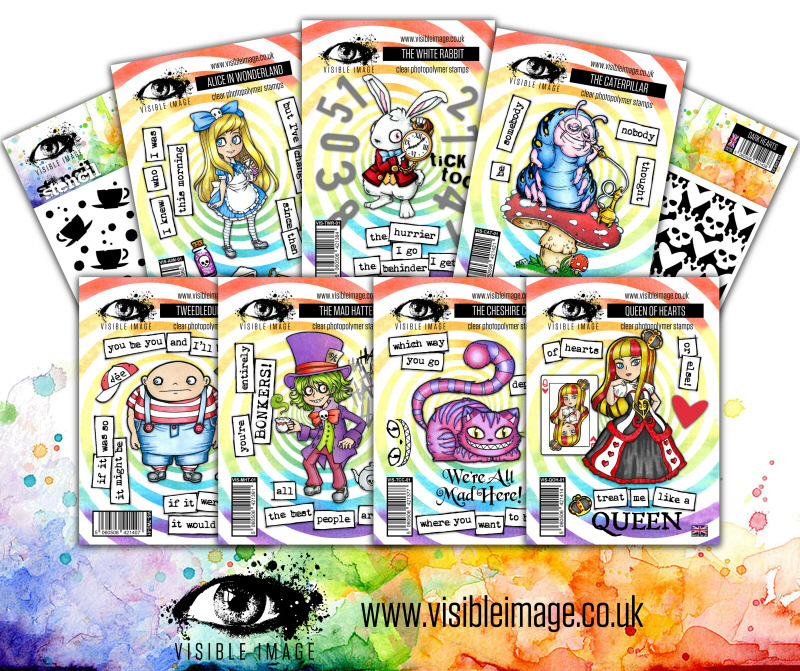 I was so excited to receive some of the fantastic new release stamp sets from Visible Image – especially the Wonderland character sets – I’m secretly hoping that a few more drop through my letterbox!!! Today I introduce the Mad Hatter to you (you may have seen a preview of him the other night in the Visible Image Facebook group). I used black Memento ink to stamp him then coloured with Promarkers and Copics. I added some detail with a black Prismacolour pencil. 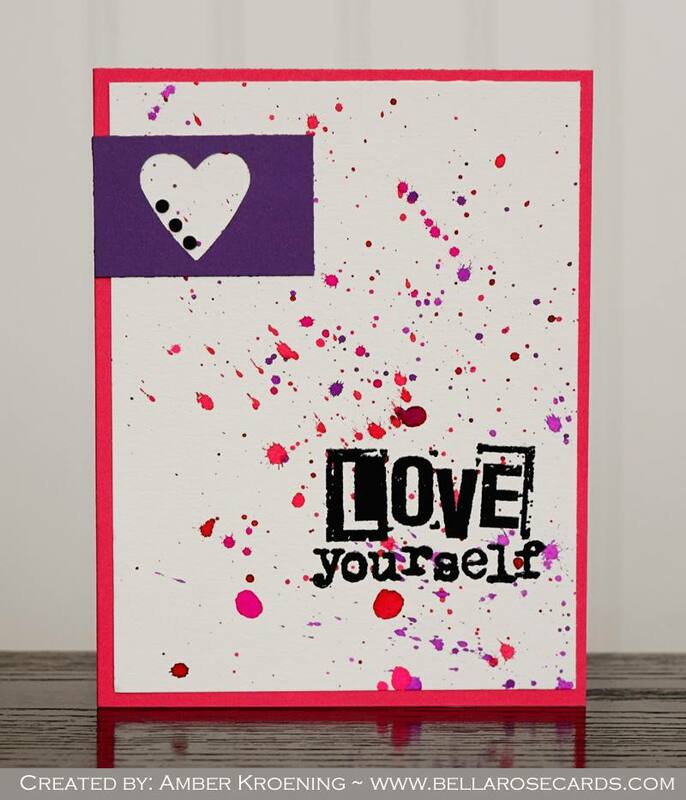 The background was created using one of the Plasma background stamps embossed with lilac embossing powder. I then over-stamped the ‘ha ha’ and used Wow flourescent yellow embossing powder. The words were stamped with Spiced Marmalade Distress ink – the perfect shade of orange! I hope you find this crazy character as fun and endearing as I do – both he and the background stamps are available to pre-order from 6th Feb on the website (link below). Come and join the Visible Image Facebook Group – For DT inspiration, monthly Show and Tell contest, hang out with other Visible Image fans and share your work! Hello! Thanks for coming to see us today! I have a very special card today. 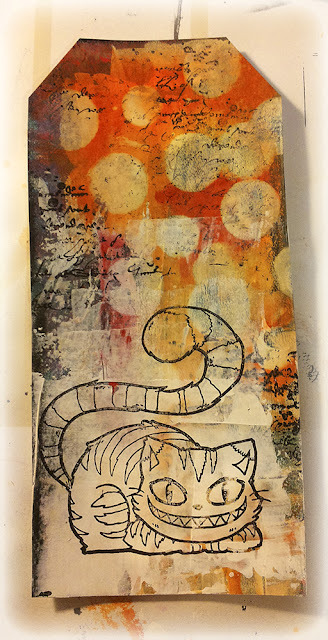 I made something I’ve never made before with a card, actually I haven’t done much of it at all – in any way! It just popped into my mind when I saw Clara from Visible Image and I had to give it a try. I didn’t know where to start, so I just started. I mounted Clara on another cardstock to get a bigger and sturdier base for the card. Then I went on with gesso, texture paste, acrylic colors, metallic rub-ons, glimmer glam, glimmer glaze, inka gold, and probably some more medium I don’t remember. I colored the roses etc before I glue them on to the card, I glued metallic pieces I found and a whole bunch of small old clock pieces. Painted over some, let some be as they where. I built it up layer by layer and after 3 hours I was finally finished. phew. It ended up very much like the picture in my head so I’m happy with it. Thanks to Clara I had so much fun doing this. Have you seen the first two previews of our BRAND NEW stamp collections? Not only are they awesome images, but they are gorgeously thick, deeply etched, clear photopolymer stamps! Perfect stamping. Always. They will be available to pre-order from the 6th of February. Come back tomorrow for more exciting previews!!! And of course more fabulous Design Team inspiration! Join our Facebook group too… We are having SO MUCH fun this week! It’s Wednesday – So I’m back! This time with Fae from Fae Hope Set from Visible Image. I really like that you get the wings separate so you can choose if you like Fae with or without the wings. I stamped two versions when I tried her, and my daughter grabbed Fae without her wings so I colored in the image with the wings. *smile* I decided to go for a white card and leave the colors for the image to pop out. Other: Frantage embossing around edges of image. Wink of Stellas glitter on flowers. Colors: Skin: E000-00-21-11-04-R20, Hair: Y21-YR23-E35, Dress: BG70-(71)-72-75-78, Wings: RV000-91-93-BG0000. Today I would like to introduce you to Emma from Elegant Emma Set from Visible Image. Isn’t she lovely? Can you call the style of the card ”strict decorated” LOL? Hope you notice the rose in the frame I made around her, it’s also from the set. It’s a bit unusual for me to go for Lilac / Purple colors, but I like it. If you wonder about the sticker letters, it says ”Happy Birthday” in Swedish. Embellishments: Flowers (Mandys, WOC), Bling, Stars (WOC), Doilies, Lace. Other: Chalked edges and hand drawed black frame around image. Don’t forget to check out the new Valentine stamps! See you tomorrow we hope, when Teresa will be here to inspire you! Good Morning! Hope the first week back to normal after the holidays is going well for you, the weekend is in sight! Today sees my first post as part of the Design Team for Visible Image stamps, and to say I am excited is a bit of an understatement!! I have been a fan of Visible Image stamps for a long time now as they have quirky and original designs, as well as being great quality polymer which stamp perfectly every time! Towards the end of last year they released a set of stamps entitled ‘Express Yourself’ with some fantastic words and phrases. I’ve used one of them for my project today. As it’s the start of a new year I wanted to send a message out to all my friends – you may not have great health or wealth, but we can always find it in ourselves to be happy about something, however small. I thought that ‘Harley Jester’ was the perfect character to team with this sentiment. I stamped Harley with Black Memento ink and coloured him with Promarkers. 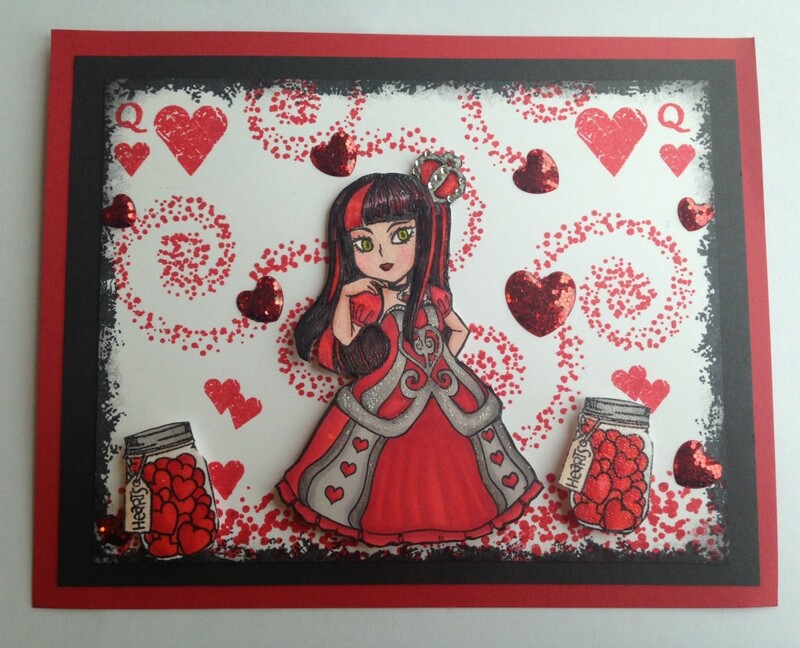 The hearts are stamped with Ladybug Red ink on the background then I added Harley with 3d foam. I stamped the sentiment twice, once in red and once in black, then cut and pieced it together. I matted it onto red and black card before attaching to the card front. I hope you have enjoyed looking at my project today – I’ll be sharing a fantastic Visible Image project every Thursday…..see you next week! You’ll also find us on twitter, Pinterest and Instagram 🙂 So whatever is your preferred social media site, you’ll find us there! Today is my first blogpost for Visible Image and I’m a bit nervous actually. I’m so happy I got the chance to create with these lovely stamps and try them out in my ”card making world”. 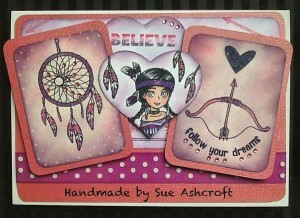 For this card I’ve used stamps from Tala Catching Dreams Set. As you can see the words are a little bit bent, and I just looooove when it’s clear stamps and you can do that! The indian border is stamped in the corners of the bottom panel and then twice and cut out as a decoration. Tala is colored with Copics, as I almost always use for my images. Colors: Skin: E000-00-21-11-04-R20, Hair: W9-7-5-3, Clothes: E47-44-43, Green: YG99-97-95. Tomorrow we have the first Visible Image Design Team project from Teresa Morgan, so be sure to come back and see us then! Hello and thanks for visiting us here on the Visible Image stamps blog. Today is my first 2015 weekly post for Visible Image Stamps! This year I have some big plans, well I say big, but what I mean is big for me 🙂 I really intend on pushing myself as a designer and finally want to make the leap into demonstrating (and not just behind a camera). 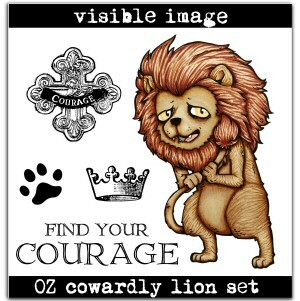 I have made him into a card also using the ‘find your courage sentiment’ from his set. 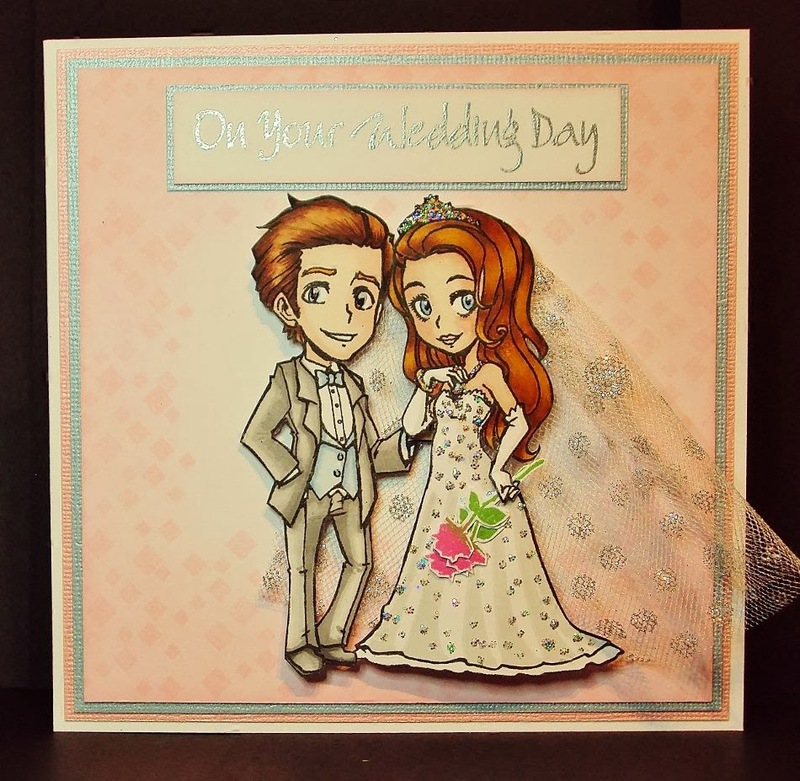 The embellishment in the corner was made using another of the stamps in his set, I first coloured a piece of card with the same coloured Promarker I used for his eyes (just to match it all in ;p ) and I then stamped and embossed it in white over the top. I then fussy cut it out, slightly curved parts of it and mounted it onto my card using different depth foam sticky pads. I may keep this card for myself, just to remind me that I need to have the courage to go for my dreams 🙂 What dreams or aspirations do you all have for this coming year? I would love to hear about them. Don’t forget to check out all the blog posts for more amazing DT inspiration. Thanks millions for stopping by and I hope to see you again soon. Thank you so much for coming to see us today, you’ll find all our Design team inspiration HERE, and we will be back tomorrow with an amazing project from Kim Bacon! Hello There! Thanks for coming to see us here on the Visible Image blog today! Are you a fan of Lord of The Rings and The Hobbit? 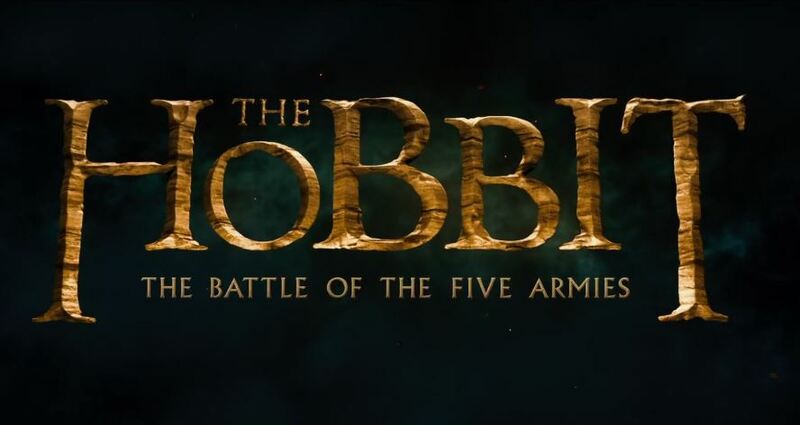 If you are, you’ll know that the final film in ‘The Hobbit’ prequel trilogy has now been released! And we have a very special offer for you! You will find these amazing stamps HERE! We decided to start decorating our hall, stairs and landing on Saturday and it kind of took over our whole weekend so apologies for missing yesterday’s post! Hey everyone 🙂 I hope you are all well. I have used Fae from the Fae Hope set and coloured her with Promarkers. I coloured her clothes in Green and red to give them a festive feel, so that i could use Fae for a Christmas card. Don’t forget the awesome December Challenge (Our last one!!) where there’s a chance to win an amazing prize of a £20 spend on Visible Image’s superb stamps. Come and see us again tomorrow for Soozie Tuesday… we’ll have gorgeous inspiration from Sue Joseph! 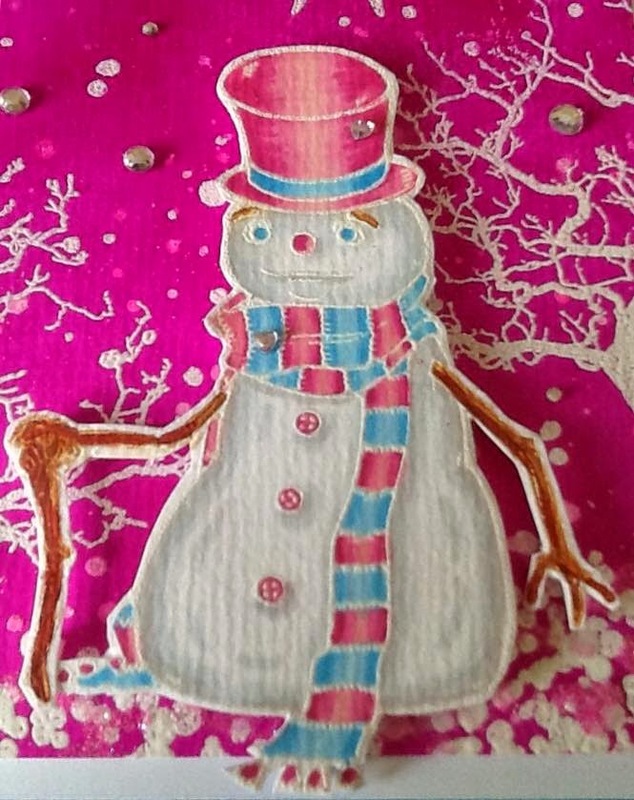 It’s ‘Soozie Tooseday’ once again here at the fantabulous Visible ImageI feel a little bit Christmassy so I made a feminine creation…..
How cute is he/she? 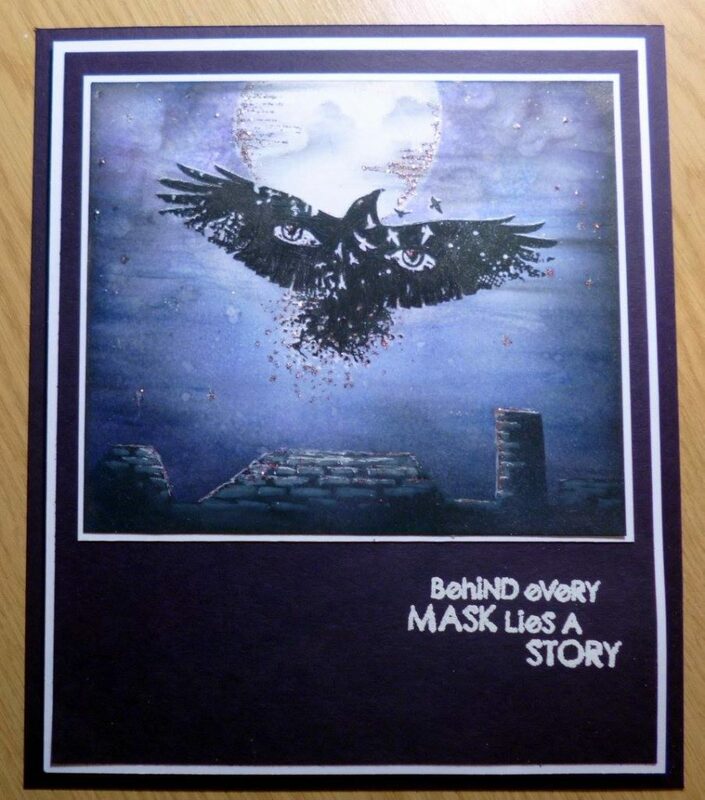 …..and at only £6.99!! 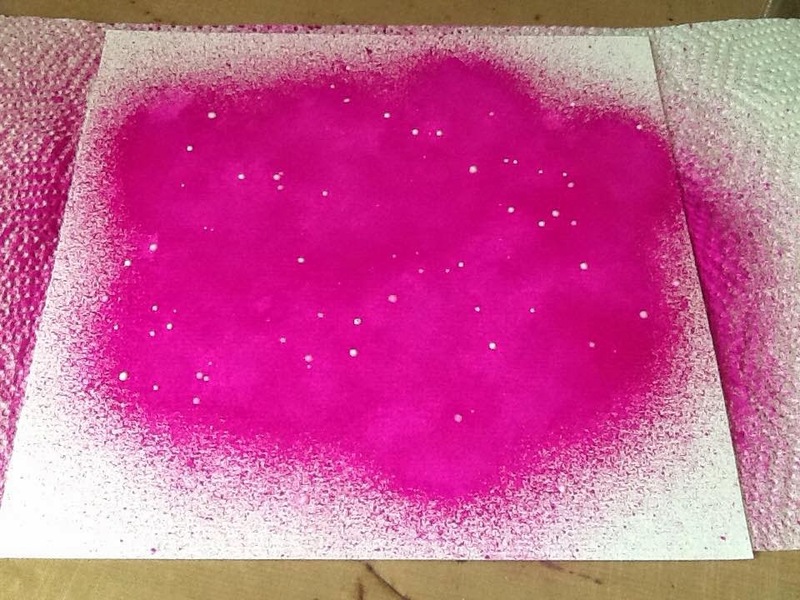 To begin my creation I sprayed some funky fuchsia dylusion ink onto some watercolour card and when dry I dripped some white linen dylusion ink on randomly to give a snowy effect. Watch this space and keep a checking our Facebook group for news and you can also enter the challenge there too! 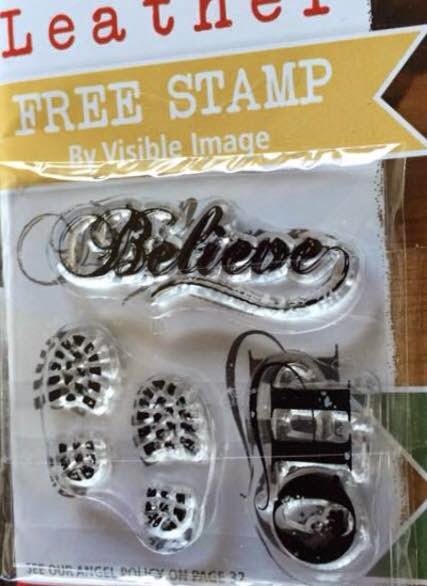 There’s also another competition going on too with the freebie stamps from the December issue of craft stamper, so if you haven’t already bought it, go get it and make a creation with these awesome free stamps made by Visible Image! We’ll be back with more fabulous inspiration tomorrow…. And very soon we will be sharing news of our NEW STAMPS! Excited!!! It’s the month of Halloween, so our challenge for you is to ‘get spooky’ with our stamps! Get creatively spooky for your chance to WIN £20 to spend on our stamps! in the Wicked Witch’s hat! Surrounded by skulls, wire, spiders, webs and our Ink Splats! Edward has been superbly vamped up by Pauline, stepping our from our Forest Background with his bats! A brilliant spooky graveyard setting for Fae created by Sam. Doesn’t Fae look amazing as a Dark Angel…Immortal is Forever! The sentiment is from our Edward is Immortal set. Fantastic work by Kim B. This reminds me of a fun house at the fairground…. Molly is looking super cool and all set for Hallloween fun! She’ll be collecting plenty of sweets when they see the headless teddy bear! Who knows what tricks she might play… Mwah hahahaha! SO…… What could you create for Halloween with Visible Image stamps? Can’t wait to see your entries…the more creative the better! You will find the CHALLENGE RULES HERE! Hello and welcome on this awesome day! RELEASE THE VISIBLE IMAGE OZ CHARACTER STAMPS!!! Our Design Team have been going crazy for these NEW stamps and we are so excited to show you what they’ve been creating! RELEASE THE FLYING MONKEYS….. !!! You can order your Oz characters HERE! 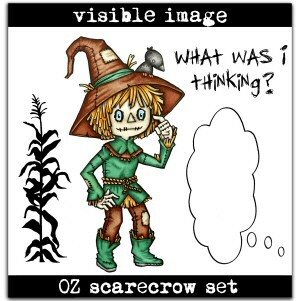 Wizard of Oz Stamps Visible Image style ! Yes, ‘We’re Off To See The Wizard’…. In The Merry Old Land Of Oz! We love them and we hope you do too! Available to PRE-ORDER HERE right now! Be one of the first to get your hands on these amazing, unique stamp sets! Visible Image stamps are very deeply etched clear stamps, that stamp perfectly every time you use them. We hand cut every stamp ready for you to use! Oz Flying Monkey Visible Image Stamp! Hi! Thanks for coming to see us again today on the Visible Image blog 🙂 We are SO EXCITED!!! 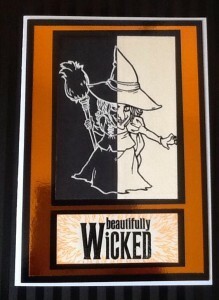 NEW Wizard of Oz inspired stamps! To celebrate 75 years of this awesome film. Here is the final sneak peek!!! And of course, each character comes in their own unique set of stamps! Tomorrow – Saturday August 30th – all will be revealed!!! And they will be available to pre-order! Release date Friday September 5th, so get your order in early and be the first to get your hands on these incredible stamp sets! Join our Facebook Group and be the first to see all our NEWS and sneak peeks! You’ve already had sneak peeks of Dorothy, Scarecrow, Tin Man and The Lion! We will be sharing our last sneak peek this afternoon, and tomorrow – Saturday August 30th – all will be revealed!!! They will be available to pre-order tomorrow too – release date Friday September 5th. Celebrating 75 years of this amazing film. We will be sharing our last sneaks peek tomorrow, and on Saturday August 30th all will be revealed!!! They will be available to pre-order from Saturday August 30th – release date Friday September 5th. The Wizard of Oz ! We have already shown you a sneak peek of Dorothy, and the Scarecrow. If you missed our previous posts, scroll down to find them! We will be sharing more sneak peeks every day this week, leading up to Saturday August 30th when all will be revealed…. Come and join our EVENT on Facebook for your chance to WIN one of these amazing NEW stamp sets! These sets will be available to pre-order from Saturday August 30th – release date Friday September 5th. Yesterday we announced our exciting news! 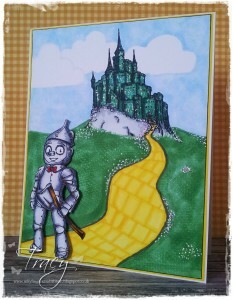 NEW Wizard of Oz inspired stamps are coming this Saturday! ! We will be sharing another sneak peek tomorrow, and every day this week, leading up to Saturday August 30th when all will be revealed…. We are SO excited about these new stamps! And of course each character will have their own unique set! NEW Visible Image Stamps Release ! The Hollywood premiere was on August 15, 1939, and the movie opened nationally 75 years ago today, on August 25, 1939. We really hope that you are as excited about these new stamps as we are! Hello and thanks so much for joining us for the launch of the Visible Image fantasy stamps ! After unveiling the stamps yesterday, we have been blown away by all the incredible, amazing, wonderful comments. We are so excited to share with you the totally awesome samples our brilliant Design Team have been creating this week. They have worked so hard and we want to say a MASSIVE THANK YOU! One word….. WOW! Thank you again team awesome! To find out more about how a particular project was created, click on their blog link, and you can enlarge the images by clicking on them. We hope your creative imaginations are now spinning with ideas! You can buy them right now here on our website, just click on STAMPS or on the top menu to enter our shop! We hope you will leave a comment for our wonderful Design Team too! We look forward to seeing what YOU create with the Visible Image fantasy stamps, make sure to show us in your Facebook Group! Visible Image stamps… Unique Designs …Superb Quality! Not that it makes a difference to us, as we have worked all weekend! it’s just brilliant to see so many orders for our stamps! the beautiful wings, and our fantastic cracked glass stamp! Created with our amazing Ripped Fishnet stamp which is adored by so many! which are so incredibly popular! We are so glad you are loving these new stamp sets! Created with one of our Tool Time stamp sets, this one is called Painted Wood! 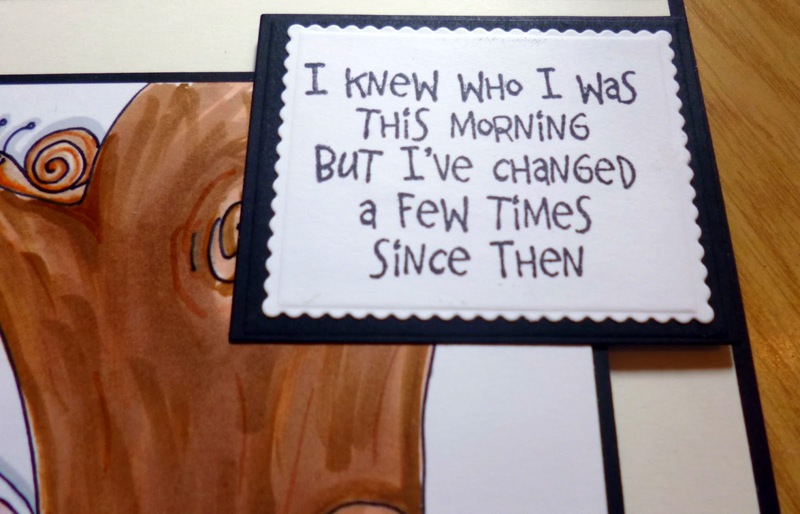 an excellent set for card making with some really brilliant sentiments! over the last few weeks, we know your work will be adored by the recipients! and get your hands on some of these fantastic stamps! All our stamps are made by Mark, and are hand-cut ready for you to use. for perfect stamping every time you use them. Don’t forget to enter our MARCH CHALLENGE! Thank you for coming to visit us today! We also have two NEW character sets! so scroll down if you missed it! Here are SIX more amazing samples! and they are now all ready for you to buy! from Visible Image stamps ! Then sit back and watch Mark’s demo’s tomorrow! on this very exciting day! The NEW Visible Image Character Stamp Sets! and create some awesome new characters! These are LIMITED EDITION sets! and so much fun to create with! to ensure they stamp out brilliantly for you. They are all hand-cut too! 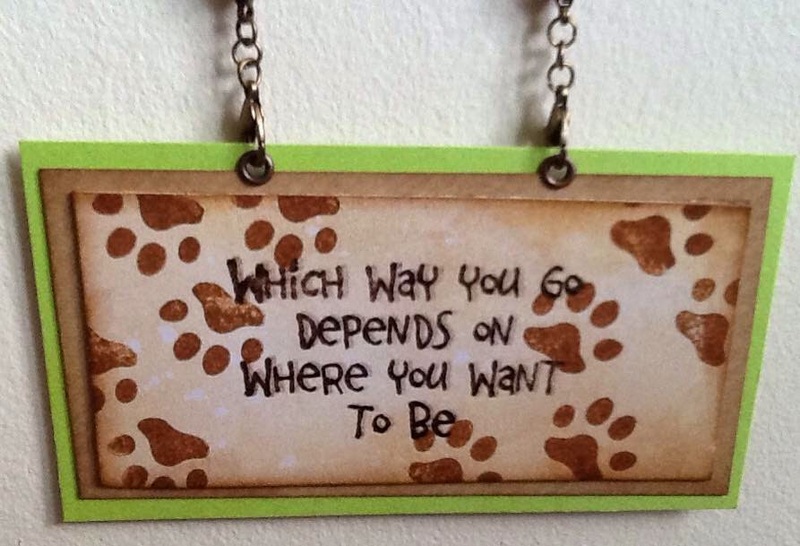 some great sentiments for each set…. 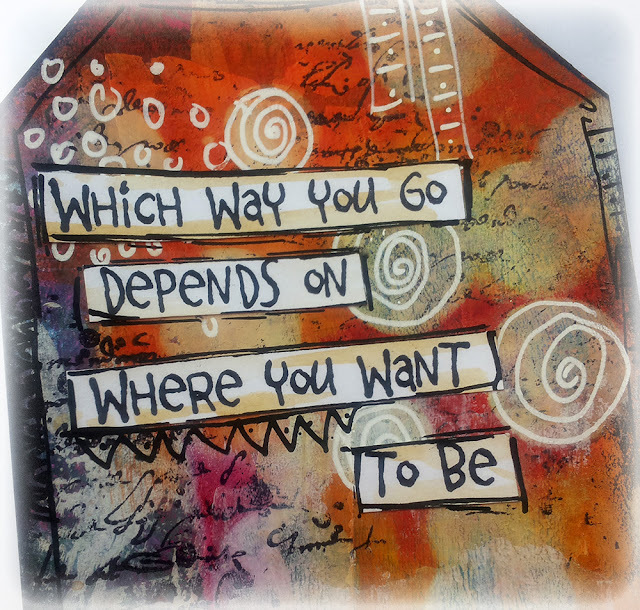 We hope you will be inspired…. Wow! What creativity, imagination and talent! We are SO excited about our NEW character stamps here at Visible Image ! You can pre-order ALL THREE SETS over on our website NOW! These stamp sets are LIMITED EDITION! and wanted to once again bring you something unique! and so much time is spent making them absolutely perfect for you. The brilliant accessory stamps and sentiments will be really versatile too! so that you can create amazing things. Isn’t he great! And WOW… 8 awesome accessory stamps in this set ! Our Design Team have gone a little bit crazy for Silverheels!!! Fantastic sentiments and more amazing stamps! Just look at that Dream Catcher and that border stamp! 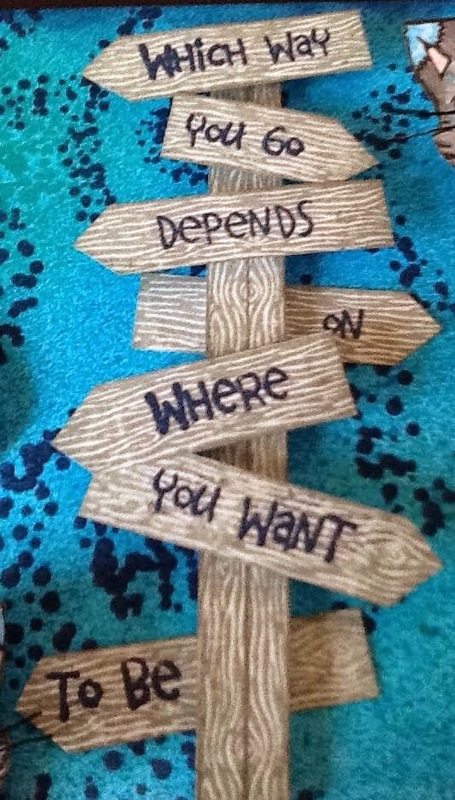 Fabulous sentiments too, perfect for getting creative with. and get them at a special discounted price too! and we cannot wait to see the results! We hope you will leave us a comment here on our blog! Hi there! Thanks for coming to see us today. From Monday through to Sunday there’s always a new Design Team card, altered item or project to inspire you. Come and join our brilliant Facebook Group, as that’s where you’ll see them first! Cathy had the Christmas spirit in her this week…..
Cathy has used our fantastic Tree Trio stamp set, the trees are stunning! Tuesday’s are known as Soozie Tuesday here at Visible Image ! from our Max Rocks Set works so well will Molly too! with two complete sell out shows on Create & Craft TV! for all your teen cards and projects! so they are definitely not just for teenagers! Or maybe it’s because some of us still feel (and act) like teenagers! Great idea! Love the wallpaper! Cheremane has used the little damask stamp from our Immortal Love stamp set, the paint, brush and splats from our Painted Wood set, and the New Home sentiment is from our Handy Hints set – which you get FREE when you purchase both our Painted Wood and Heavy Metal sets! We welcomed Pauline to our Design Team last week. It really does ‘Brighten Your Day’. Fabulous design and great fussy cutting of the Chandeliers! Our Chandelier Set was a huge hit on Create & Craft last month too. Four fantastic sentiments in the set, for many different occasions. Pauline has also used our Music Background and Grunge Flourish stamps on her brilliant card. 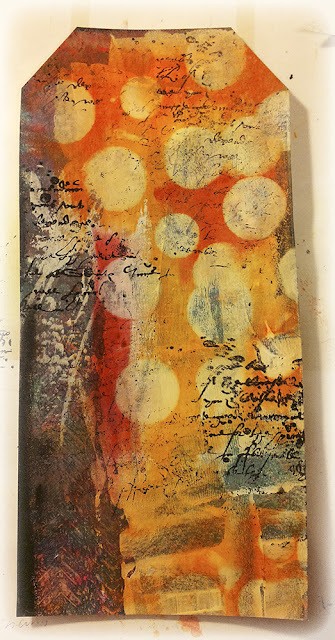 Kay has created a really old roman feel to this card with our Beauty is Art set. Loving the background and the delicate colours. 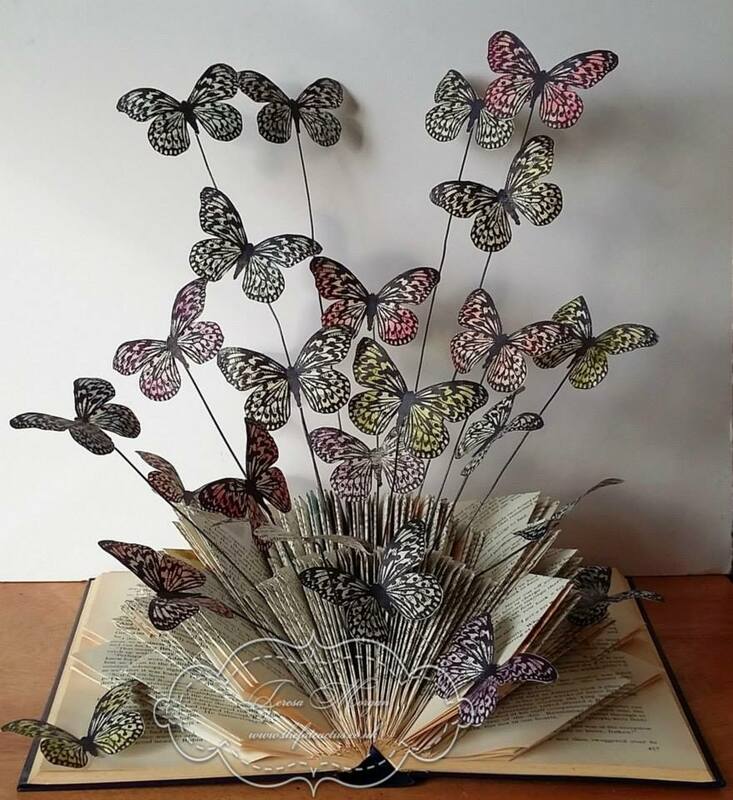 here is her stunning first project for us…..
Butterfly Sentiment and Tall Grass stamps. Fabulous design and such gorgeous colours . Thank you so much ladies, you are INKredibly talented! which will be launched very soon! Don’t forget to enter our challenge! So, if you don’t have one yet….what are you waiting for?! Once you try them you will be hooked! is applied when he makes them too. We also pride ourselves on our excellent service! or over in our Facebook Group soon! We are busy working this evening here at Visible Image base camp…. We are just SO excited about the launch of our NEW character stamps so cannot wait to get them finished! Towards the end of last year we realised here at Visible Image that a love for colouring images was becoming more and more popular, so we decided to launch our very first character stamps! One of these very first characters was Edgar, our awesome steampunk chap! 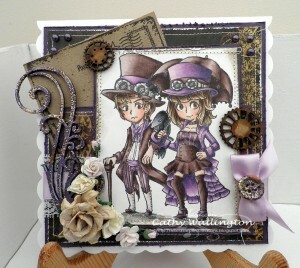 They are both so much fun to colour, and of course steampunk is such a brilliant theme to work with, there are so many amazing papers and embellishments out there to get creative with. which are adored by all those who have them! Stunning work from Cathy who just LOVES Clara and Edgar ! What could you create with them? Pop over to our website now and treat yourself! about to help you learn. Our stamps are superb… deeply etched and clear… Perfect Stamping! we’re busy working on our NEW character stamp sets! We know you’ll adore them! Our Design Team cannot wait to get their hands on them! fantastic sets, and original verses and sentiments – more coming very soon! Hand-made clear stamps which stamp perfectly every time you use them. Deeply etched 4mm thick and hand-cut ready for you to use too! 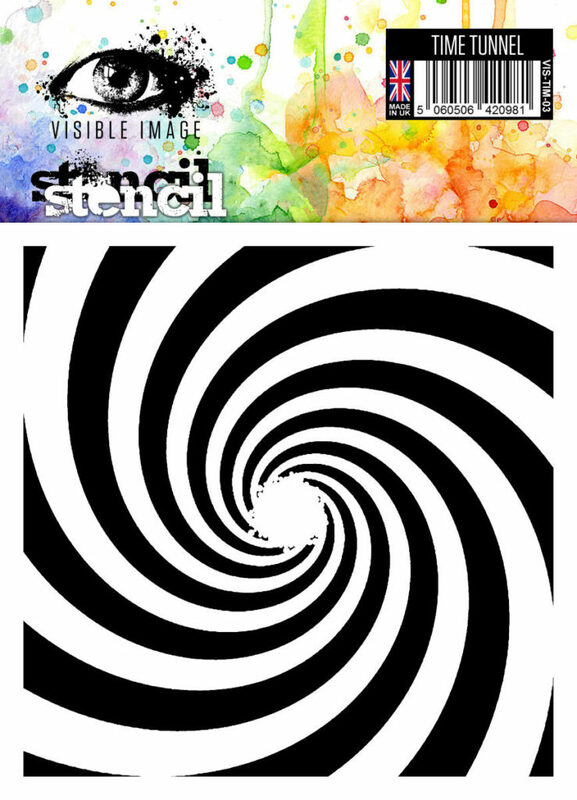 and to receive the Visible Image Blinkie for INKcredible stamping ! And of course FOLLOW OUR BLOG right here on the left hand sidebar! Hope to see you again real soon ! Visible Image Stamps Have Character ! Hello and welcome to our June challenge! NOW for some exciting news!!! Also… check out the July issue of Craft Stamper magazine, out next week! WHERE YOU’LL HEAR ALL OUR NEWS FIRST! but we’d love it if you did!